Liston College caters for boys in Year 7-13. We accept students primarily in Year 7. Enrolment at other levels is subject to availability. 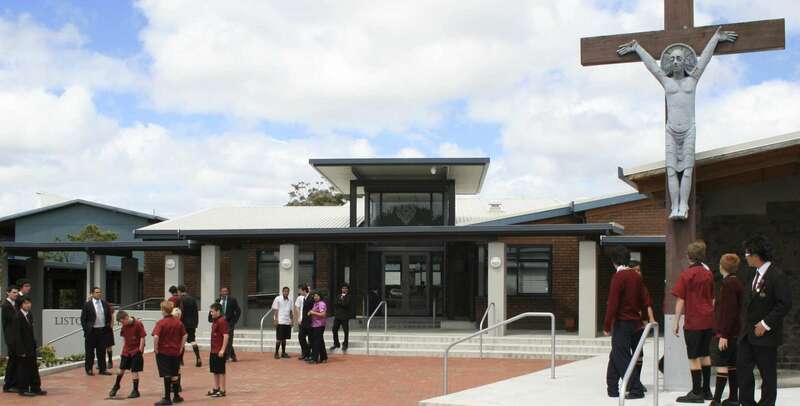 In line with our commitment to the Special Character of Liston College and the Integrated Schools agreement between the Ministry of Education and the Catholic Diocese of Auckland, 95% or more of or students are from a preference background. Our applications are open the year before your son is due to start. Interviews will take place through Term 2 2019. Families will be notified of the outcome of their application by the beginning of Term 3 2019. * Late enrolments will be placed on a wait list and contacted if space is available. Enrolment interviews for Year 7 applicants will commence at the end of Term 1 and continue into Term 2. Enrolment interviews for Year 8-13 applicants will take place in Term 2. Please note that interviews at these levels will be possible only if vacancies are available. The Enrolment Form is a confidential form in which we ask for information that will begin the process of enrolment for your son to attend Liston College. Applications must be submitted with supporting documentation. For verification purposes, the original documents (see below) must be brought to the school office or a certified copy by a JP or Solicitor. New Zealand passport (details page). A copy of the student’s New Zealand or Australian passport (details page) OR NZ Citizenship certificate, showing date of first arrival in New Zealand. A copy of the student passport (details page), showing date of first arrival in New Zealand. Student Residency Visa or Student Visa. Parent residency or work visas. Deirdre Bennett, Principal’s PA, Liston College, 69 Rathgar Road, Henderson, Auckland 0610. Once the application is received, you will be contacted regarding an enrolment interview. The interview is an important step in your son’s application. The interview is with Principal (or Deputy Principal in his absence) and is an important time to ask any necessary questions. Parent partnership is an important aspect of our school and we expect the presence of both parents at this interview. Parents and students are expected to demonstrate a willingness and ability to support the Catholic Character of the College. Liston College Computer and Internet Acceptable Use Agreement – students. To secure the offered place, parents must complete, sign and return the Acceptance form and Computer and Internet Agreement form, along with payment of a $250 acceptance fee. This may be paid by internet banking, cash, credit card, eftpos or cheque. This is part payment of the 1st term’s fees (or the term that the student starts at Liston College). Preference enrolment is given to those students whose parents have established a particular or general religious connection with the Special Character of the College. The Preference Certificate is enclosed in this pack or available from any Catholic Priest of the parishes that the College serves. A non-preference enrolment may be granted to those who cannot produce a Preference Certificate. The College has a limited number places for non-preference students. Non-preference places are allocated at the discretion of the Principal. Applications open 29 January 2019 and close at 4pm on Friday 26 April 2019. * Extended until Friday 3 May.